Ideally situated close to ski-lifts and the fantastic slopes of Arc 2000, The Spitzberg is located in the Altitude Résidence. Attractively furnished in traditional style and has a comfortable open-plan lounge/dining area with satellite TV. Chalet Spitzberg also has free use of the brand new pool complex in the residence. This includes a main pool with shallow children's play area, hot pool, large sauna, fitness room and new changing area. Easy 3 minutes’ walk (250m) to the nearest ski lift for swift and easy access to and from the slopes. Ski virtually to and from the doorstep. 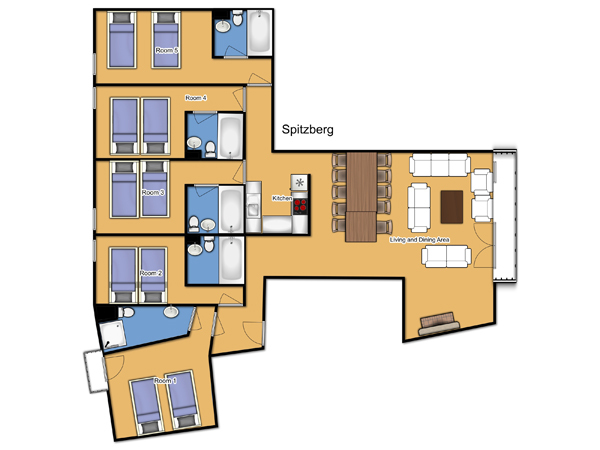 Room 1: Twin with en suite shower/wc/balcony. Rooms 2-5: Twin with en suite bath/wc.